Alec: I have been waiting for you to bring up the self-portrait. I was at Jen Beckman last week and I noticed one that fit in oddly. It also did make me put a lot of pieces together; you were on your game earlier thai I. I had read about it but never asked. So good, I can hardly stand it. Love Ashbery ever so much. Great choice, AS. Sorry to be so mundane in the face of great poetry but wouldn’t that be Parmigianino’s left hand? 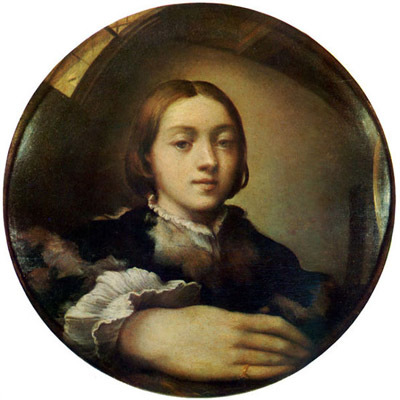 From Parmigianino’s perspective, it is his right hand (we are looking at the reflection of a mirror). Ondine, sit in front of a concave mirror with your right hand closest to the mirror and tell me if the image you see matches the painting above. When one looks into a mirror is your good side the right side? For me the good side is the right side that is right.